Congratulations to Historic Brewers Hill resident Terry Mambu Rasch on being awarded the 2017 Dr. James G. White 6th District Difference Maker Award. Terry was presented with the award at Alderwoman Coggs 6th District meeting held on January 17th. About Terry…Terry has been a resident of the Brewers Hill neighborhood since 2008 and served on the Historic Brewers Hill Association Board of Directors from 2013 – 2017 (both as Auxiliary Member and Vice President). While on the Board, Terry co-chaired the fundraising committee for Phase I of the Gateway Signage Project, helping to raise over $20,000. 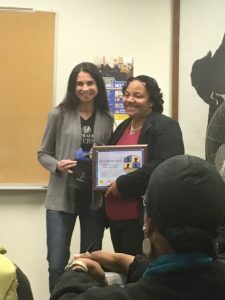 She has lead various neighborhood meetings, represented the HBHA at various City meetings and functions, actively coordinated numerous social events, and helps to mentor students at Carver Academy. Terry has a natural leadership ability and is able to bring various opinions and thoughts together in a concise yet thorough manner. 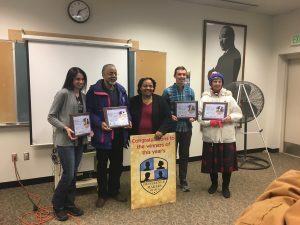 About the award…Alderwoman Coggs established the Dr. James G. White 6th District Difference Maker Award to recognize those residents and organizations that work diligently to improve and strengthen the quality of life for themselves, their neighborhood, and the City of Milwaukee. Dr. White was a resident of the 6th District who served as a county supervisor and the regional vice president of WestCare Wisconsin Harrambee Community Center, facilitating countless neighborhood projects and programs. He used his gifts, talents and knowledge to improve and empower his community.